The classical music radio station KWAX, on the dial in Eugene at 91.1, is a tiny operation, with a total of exactly three employees. Yet it’s the most satisfying classical station in the Pacific Northwest and one of the best in the country. The fact is, in the world of classical music radio, small is beautiful. KWAX broadcasts 24 hours a day, 365 days a year from its tiny office at 75 Centennial Loop in Eugene, but there’s no one at home evenings, nights, and weekends. The station was one of the first in the country to use automated transmission, so Mondays through Fridays, from 9:00 in the morning till 1:00 p.m., you’ll hear Caitriona (pronounced Katrina) Bolster, and from 1:00 until 5:00 it’s Rocky Lamanna, but that’s it for live broadcasting. Thereafter, depending on the day of the week, a variety of shows originated by other stations and music services fill the schedule until 10:00 p.m., when Peter Van De Graaff and the Beethoven Satellite Network take over until 6:00 a.m. Then it’s Performance Today with Fred Child from 6:00 to 8:00 and Bill McLaughlin’s Exploring Music until 9:00, and the whole cycle starts over. Child’s and McLaughlin’s syndicated shows are two of the best, and most popular, in the country, and the quality holds true for the rest of KWAX’s satellite feeds, which include, among others, Tony Morris’s Classical Guitar Alive, Marjorie Herman’s Sounds Choral, On the Wind (chamber music for wind instruments), Fred Flaxman’s Compact Discoveries, Henry Fogel’s Collector’s Corner, David Dubal’s The Piano Matters, and Ross Amico’s show featuring film music, Picture Perfect. A host of live symphony broadcasts round out the automated schedule. In May these will feature no fewer than 25 full concerts by nine orchestras, from the Orpheus and St. Paul Chamber Orchestras and Daniel Barenboim’s West-Eastern Divan Orchestra to the Philadelphia, Chicago, and New York bands and Amsterdam’s Concertgebouw, not to mention 4 broadcasts from the Santa Fe Chamber Music Festival and two each from the Metropolitan Opera and the Lyric Opera of Chicago. 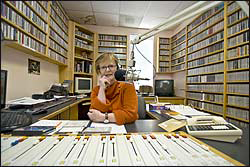 The satellite shows are great, but even better are Bolster’s and Lamanna’s regular weekday shows, in which a satisfying selection of music (very few warhorses, whole pieces instead of movements, no time-fillers, no “drive time” or “lunch time” nonsense) is mixed with occasional announcements of upcoming local concerts and interviews with visiting musicians and composers. Bolster and Lamanna choose their own music, and they avoid overlapping by paying attention to each other and by using a 400-piece “A list” of so-called “most popular” pieces, ranging from Pachelbel’s ubiquitous Canon to Prokofiev’s Lt. Kijé Suite, and including all of Beethoven’s piano concertos, the first 8 of his symphonies, Bach’s Brandenburgs, orchestral suites, and cello suites, 12 Dvoraks, 14 Haydns, 15 Brahmses, 20 Mozarts, and 20 Tchaikovskys. These “A list” pieces are played not more often than once a month or so. Listening to KWAX, I ask myself why so many bigger and richer classical music stations are in such a lather about getting their share of the so-called radio listening audience. Seems to me that in a given listening area, there will be a small but loyal group of classical music lovers who will tune in the local classical music station, if it’s halfway decent, which is to say if its music isn’t hackneyed, if it doesn’t constantly play mere movements of pieces, if it doesn’t program a diet of solo guitar music, and if its on-air personnel don’t sound like complete ignoramuses. By the same token, it seems unlikely that any significant number of radio listeners in a given broadcast area will suddenly switch from easy listening or country classics or all-talk stations to the classical one. So why do classical stations beat themselves up? All they have to do is offer a decent product to people already predisposed to want it. In Eugene that’s what they do, and they don’t have to kill themselves with all kinds of extra shows or with gaudy incentives to lure supporting members — KWAX subscribers are allowed to choose a piece to be aired, and that’s their only perk, and they love it. After all, a certain percentage of listeners will pledge their support, and a certain percentage won’t. One suspects that these percentages are more or less constant. So create your station using the percentage who will, make good use of the wealth of excellent satellite feeds, hire a few intelligent and knowledgeable on-air folks, and call it good. It helps, I reckon, if you’re a non-union shop, and not locked into a certain percentage of live programming. I can’t for the life of me understand why any city, of whatever size, needs to have a not-for profit FM classical music station with a budget of several million dollars. KWAX proves that the Eugene model could work just as well in Chicago, Los Angeles, or Portland, where at KQAC Andrea Murray and Brandi Parisi handle the airwaves from midnight to 9:00 a.m. for no good reason. KWAX pays $5,000 a year — a YEAR! — for Peter Van De Graaff to do the duty from 10 p.m. until 6:00 a.m., and Van de Graaff is an almost ideal late-night host. He plays a nice variety of largely unhackneyed music, he has a pleasant voice, and he keeps his talk to a minimum. See for yourself what Eugene can offer; KWAX streams round-the-clock on the internet. Give it a try and hear what a sensible classical music station sounds like.